There was a time in Guatemala where when it came to processing coffee, purity was king. It was all about using natural spring water for every step in processing where water was needed… and using it to delicately transport the coffee from point A to point B. Then a few decades ago things changed and folks had land disputes over water rights because people “downstream” only got dirty contaminated water. Soon after it became popular to run an environmentally conscious plantation and recycle everything… Well the problem with this is if you wash the coffee and transport it to patios with fermented recycled water… it ends up stained and although it may not be bad… you increase the chance of post wetmill fermentation and you also guarantee inconsistency. There are still MANY who adhere to one of the above extremes as they are both traditional old school. We have used recycled water where it makes sense and pure natural spring for the final steps, again where it makes sense so the coffee is never stained and is perfectly clean. This really does contribute not only to a clean cup, but also gives maximum consistency assuming all other variables are managed properly. There are many other variables… the list is quite long. The reality is that over the years most growers in Guatemala have learned what it takes to produce exceptional coffee. To the extent that extremely small growers have their own little wet mills and they’ll throw a piece of plastic out, or dry on packed dirt, or on a big rock if they have to – to meet standards of what Guatemala calls clean coffee. The above picture remains in my opinion the start of what is ultimately the critical point for most estates in Guatemala, be it 1/4 of an acre or a few thousand acres. It is in my opinion quite an achievement in the development of coffee (particularly for a country that is so much smaller than Colombia or Brazil) to have such a high level of consistency and quality control exercised by all even the smallest growers who have less than 1/4 of an acre. The conflict with fermentation is that if one crosses the line and goes to far, the coffee is ruined as “overfermentation” is in fact the worst and most identifiable defect. However fermentation remains the weakest link because there is no significant loss in the quality of the coffee if it is cut short a bit. It can proceed as an exceptional product in the commodity market. 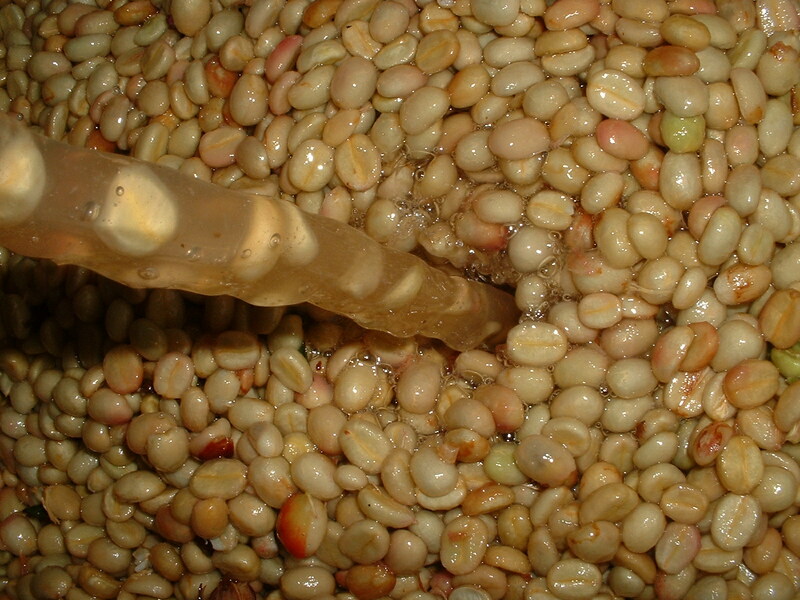 And again this is only my opinion, but it is in this step where bacteria are eating sugars that the bean continues to develop and what is truly unique and special about the bean comes alive as it completes its maturity. This next year with the help of just over a dozen folks around the world who will test out samples I will anxiously await the results and possibly turn some of these theories into something a little bit more concrete. Otherwise today we will continue to see complacency even in places like Guatemala where the coffee grower is fortunate to have an abundance of great recourses from Anacafe to benevolent neighbors to eager veterans and rookies that come and visit such as George Howell and .. well I won’t name names when it comes to rookies, but there’s nothing wrong with being a rookie if the passion is there to commit to excellence and quality with out compromise. These topics aren’t for those who want to look over and see what the next guy is doing rather for those who want to define the cutting edge and are willing to go out on a limb risking falling on your face in the genuine pursuit of excellence.